It's been one of those busy weeks where I've done a lot of work but it feels like I don't have a lot to show for it. This happens when you start delving into tougher design / programming challenges. Completing one of these tasks could take hours even and yet the end results, from an outside perspective, seem like they should have been easy / quick. Hypership Out of Control for WP7 has been out for over two weeks now in its lite, ad-supported form. This last week I didn't do any development on the game for a change, though I will likely start working on the non-lite version in the next week or two and on a 1.4 version that adds a few new wrinkles to the game (new ship colors are likely). Revenue generated from ads so far hadn't been too good. Most days have made me about $1.50 and that seems to be trending downward. After spending $40 on an ad on a WP7 website to try and help, that means so far I've lost about $10 on the game. I'm waiting for the day this trend reverses and I start having more people playing, but I'm getting less hopeful that will happen. The silver lining is that I continue to add new users at a decent clip (my low day being 73 new users) so maybe that day will come, just not as soon as I'd like. If all I'm going to make is a dollar a day though, developing future titles for WP7 doesn't seem very worthwhile. I implemented a lot of changes based on user feedback from my second playtest this week. 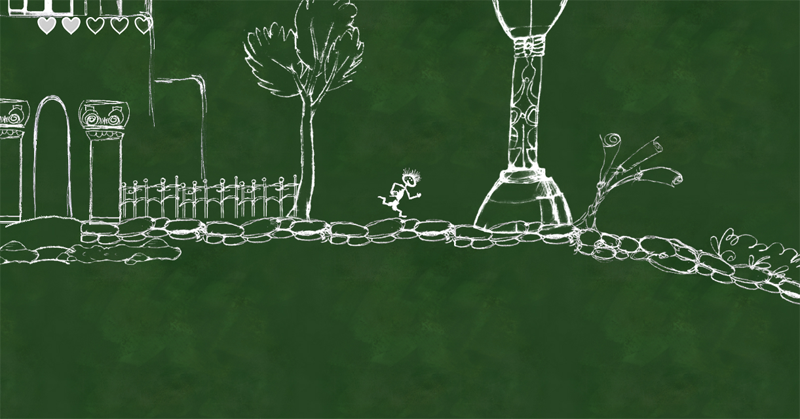 Movement once again got some more tweaking (mainly the "sliddyness" of the game). I added a new enemy as well, a fire bat, which is basically a bat made out of fire that flies back and forth in a level. I started work on adding blocks that crumble as you step on them too. I'm aiming to do 40 levels in Volchaos. One of the challenges in doing so many levels is making them all unique and interesting. That's why I'm adding new enemies (fire bat) and new mechanics (crumbling blocks). Gamers aren't going to want to finish the game if each subsequent level feels like the one before it. While graphically they probably will look a lot alike, it's my aim to make sure that no two levels feel alike. So far I have 20 levels done and I'm very happy with their variety. I implemented placeholder menus and the quit game and exit game features too (finally!). I updated the knockback on enemies after they get hit so it works correctly too. My artist has been kicking out lots of new levels (screen shot below!). I've got some work to do on the collision paths in the game and then will be adding in some more enemies too. Perhaps once I get a few more enemies in, it will be time to finally release a video of this game in action. Verizon is really frustrating when it comes to releasing a WP7 device. I waited for months for them because there kept being rumored release dates coming soon. May 19th is the latest such date. For those still waiting for Verizon, I hope this is the final date you get. I got tired of waiting, got a hold of a WP7 device without service, and bought myself an Android to use as my everyday phone. I'm happy how this worked out as my Android phone is great and now I have the ability to develop for both WP7 and Android. Once I get a few of my current projects off my plate, I plan to look more into Android development (and likely iPhone too). It's really a shame this isn't part 13 of Fun Infused Friday, as that would be very fitting. It's also a shame I didn't make this post horror themed. But it's been a long week and I just don't have the motivation right now to be that creative. This article has been view 869 times.